"Cliff must have sent his best service man! He fixed the problem fast and was so nice." We understand how great a warm summer breeze can be but we also understand how hard it is to sleep when your air conditioner is broken and your sheets are soaked with sweat. This summer, don’t let the heat keep you down. 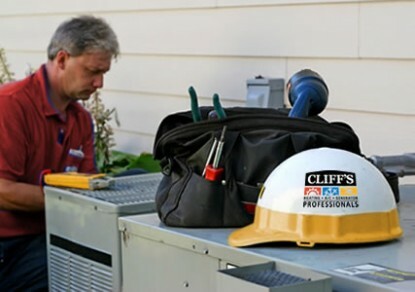 When you are in need of a professional air conditioner repair team, you need to call Cliff’s Heating & Air. We offer award-winning cooling services and have nearly 40 years of industry experience. We service Portage and the surrounding area with scheduling and affordable AC repair services. We offer competitive rates, quality products, and qualified AC technicians. Our team of qualified and certified cooling technicians are prepared to help you out when your air conditioner isn’t cooperating. We are fully staffed and professionally trained in AC repairs for both residential and commercial customers. We work with all makes and all models of air conditioners and our fully-stocked service trucks help to expedite the repair process. When customers are ready to install a new air conditioner into their home, we’re the only company that they need to call. We offer in-home consultations and estimates for all new installations. We offer a variety of products that are both high in quality but also incredibly competitive in price. At Cliff’s Heating & Air, we want to be your one-stop-shop for all things air conditioner repair and replace or install. The trick to a long and healthy life is the same as the trick for a long-lasting air conditioner: proper maintenance. Your air conditioner is a complex system that is filled with moving parts. When left alone, these parts start to degrade and your air conditioner’s performance will begin to suffer before ultimately breaking down. Here are a few reasons to consider using Cliff’s Heating & Air for all of your AC tune-up and maintenance needs. At Cliff’s Heating & Air, we do our best to offer everything our customers could need. So, whether you need an emergency air conditioning repair or a simple tune-up, our AC technicians can handle the job.